I hope everyone had a great holiday weekend and is ready to Handicap sports!!! Betting is 58% on the road dog with the line moving from -7.5+102 to -6.5-104. Models favor Dallas, Variables slightly favor Detroit and Public betting favors Dallas. So a mixed bag tonight. The variables pointing to Detroit are not that strong but they do exist. 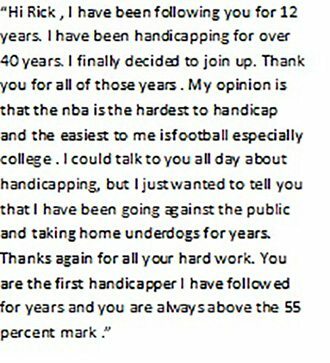 As far as public betting with 58% on the dog you have the red flag I have talked about many times before. That is whenever the bulk of the betting is on the dog it’s time to take a serious look at the favorite. I the variables was turned around I would be betting Dallas tonight. But they are not so I am passing on the game. Good Luck Tonight whichever side you take. I hope everyone had a great holiday weekend. The schedule has been light and today will be no exception. Things will start picking up again very shortly! Today no plays have been sent out but there are a few games that have potential. I will send them out to subscribers when they become clear. I have had a number of emails which typically happens this time of year requesting information regarding this service. I am in the process of putting together a Q and A section to this site and hope to have it operational by year end. My suggestion is if your thinking about signing up for this service, even if it’s only the 3-day free trial, that you first read the required reading section of this site. Once you read it, if there is anything you do not understand send me an email. Let me give you hint if a service makes any mention of those do not even consider signing up. There is no such thing as easy money in sports betting. It’s a grind! I have said this many a time and you will hear this from me again and again. Now there is money to be made but it requires not only a positive EV approach but also the appropriate bet sizing for your bankroll. This is not a maybe requirement. 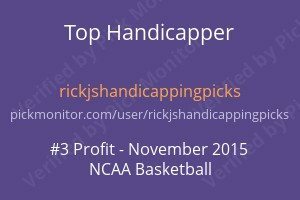 I will tell you if you do not have a routine in place that bet sizes wagers based upon your betting bankroll you will have no chance at making money betting sports on a daily basis. I am not saying you will have little chance. I am saying you will have no chance. I am here not only to give you what I feel are positive EV Plays but also to help you determine your betting bankroll size and the appropriate bet sizing for your situation. I have done this over the last year with many subscribers successfully. Finally, in addition, I am here to teach. I have had many a good conversation with subscribers on handicapping techniques both what they are and why they might work. So, after you have looked over the must read portion and satisfied yourself having no unanswered questions take a stab at one of the subscription options all of which have a 3-day free trial. Hope you see you join one of the most successful handicapping groups on the net today!! !